Films have a history of telling stories that may have gone overlooked throughout history, but this one feels even more horribly unknown than most. The story of Hidden Figures is undoubtedly worthy of being told and particularly in this uplifting and hopeful way. To see a lesser known, but vastly important, component of sending a man into orbit is wonderful and vital to appreciating these women for their roles in American history. It cannot be understated how pleasing it is to see people succeed in films, no matter the size or situation. 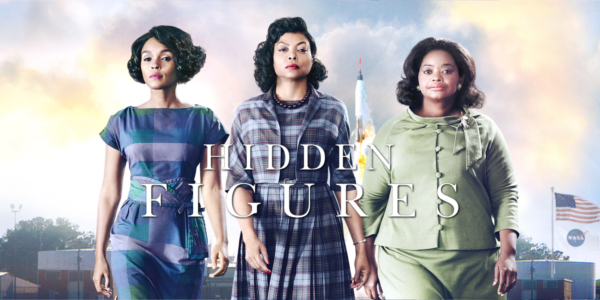 With Hidden Figures, it’s the true backbone of the film, showing these women succeed in overcoming prejudice and in their roles in sending these men to space. Some pieces of the movie feel like manufactured drama and tension, in particular elements of Glenn’s orbit, but most everything feels earned and well crafted throughout. Seeing these women succeed is half the puzzle thought, as you need to insure you get the right actors in these roles. Fortunately all three leading ladies are incredible and have insanely good chemistry amongst the group. 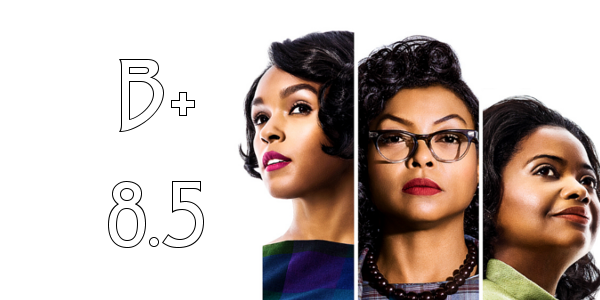 Arguably the central figure of the three is Taraji P. Henson, as mathematically gifted Katharine Johnson, who should be getting more Oscar buzz than she currently is, in a fantastic role with some great scenes sprinkled about. But as great as Henson is, Janelle Monae steals the film. Hidden Figures secures the idea that Monae will be a star if she continues to knock it out of the park and if I were to hand out only one nomination to the three it would be here to Monae for Best Supporting Actress. While these two feel like award worthy performances, Octavia Spencer is getting the most recognition. She is great in the role of course, but it’s kind of forgettable amongst the other two dynamite performances. Hidden Figures is inspiring, but it can be a little on the nose at times, hammering home the hopeful undertones a bit hard and in doing so it makes the entire film feel a bit safe. But it should be commended for not portraying the white characters as caricatures and letting the prejudice come off as systemic rather than over the top. It all feels real rather than manipulative and that’s really great when things could’ve been really overly dramatized. Overall, Hidden Figures is a good, just shy of great, film that tells a story that should’ve been known long before now. It’s hopeful and interesting without being the award bait film that it could’ve been. The film also incorporates humor in a way that other historical pieces don’t, helping ground these incredible women in reality. It may not go for broke on certain aspects but it get’s it’s message and ideas across in a film that’s certainly worth checking out.